After a photo went viral that showed a tiger crossing a road in Mahisagar District, the Gujarat Forest Department is doing its best to locate the tiger. The tiger was last seen in Lunawada Taluka. Mahesh Mahera saw the tiger crossing the road near the Boriya Village in the Mahisagar District, this is about 120km away from Ahmedabad, the picture was captured on February 6 and it went viral after he shared it to his friends on different social media platforms. After the photo went viral, the Forest Department was alerted about the free-roaming tiger in the area. 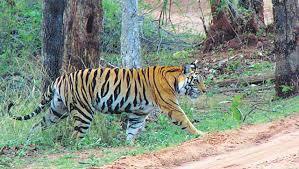 The Forest Department set-up two cameras to monitor and see the presence of the tiger in the area, the department did this as they acted on the claims of Mahesh Mahera. Mahesh Mahera said that he saw the tiger as he was returning to his home from school on the evening of February 6. According to the NTCA (National Tiger Conservation Authority) that tiger are only to be found in 18 Indian States, and Gujarat is not part of those 18 states. Madhya Pradesh and Rajasthan, the neighboring states of Gujarat are both part of the 18 states.